Top European lawmakers from Germany's Green Party leaked a confidential document last Friday (7 March) regarding talks over the Transatlantic Trade and Investment Partnership (TTIP), arguing that the disclosure is in the "public interest” and for the "protection of democracy”. On Friday (7 March), high-ranking German MEPs from the European Greens leaked a confidential document from the Council of Ministers regarding the ongoing TTIP negotiations. “TTIP threatens to take away democracy’s means for social and environmental management of the internal market,” Green MEP Sven Giegold warned, defending the decision to publish the document. It is not the first time that the Greens have criticised the planned free trade agreement between the EU and US. But last week’s leak has added fuel to the fire. Published on its very own webpage, the German language leak contains guidelines for the EU Council of Ministers in negotiations with the United States. In addition, the page also contains more detailed comments made by the Greens regarding specific paragraphs in the Council document. Still, the wording of the 18-page document is rarely concrete. Giegold admitted that the mandate seemed surprisingly positive at first glance. But anyone who is accustomed to “bureaucratic German”, he said, would quickly recognise that TTIP amounted to an “ambitious and comprehensive opening of the market”. In the Council document, it says, ”The agreement should create an effective mechanism for settling disputes between the investor and the state […].” This arbitration should uphold “just and fair treatment, including the prohibition of disproportionate, arbitrary or discriminatory measures”. The Greens rebuke passages in the text that they find particularly woolly, warning that future “investment lawyers in secret arbitration tribunals would be able to determine what is interpreted under “just and fair” treatment – not the parliaments, public authorities or courts. “It cannot be emphasised enough, that international courts of arbitration – in which companies, for example, attack environment laws or labour rights – can deprive the parliaments in Europe of their power,” Giegold said. Reacting to the release of a new study, Ska Keller, one of the top candidates for the European Greens in the upcoming EU elections, warned that TTIP could clear the way for oil and gas companies to claim billions in damages over bans and strict regulations on hydraulic fracturing. 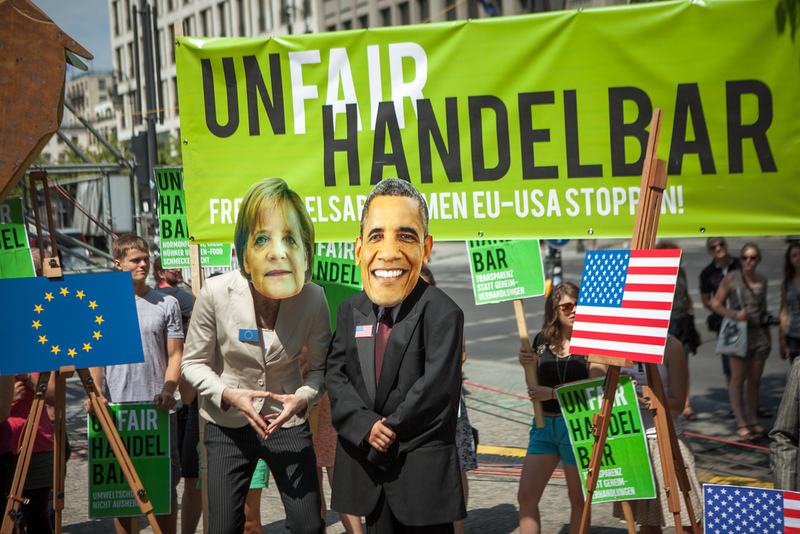 “With TTIP, companies acquire far-reaching litigation rights against environmental and social standards. That is not acceptable”, Keller said. The ongoing TTIP negotiations are subject to secrecy and Giegold is well-aware that he has breached a taboo by leaking the document. He justifies his decision in an interview published on the German Green Party website. “There is a significant public interest in TTIP; a transatlantic trade agreement could wall in our democratic sphere of influence at its heart. For that reason, I decided to publish the confidential mandate,” said Giegold. “For me, protection of democracy carries a greater weight than the Commission’s interest in undisturbed and secret back-room negotiations,” the Green MEP emphasised. On Monday (10 March), the fourth round of TTIP negotiations between the EU and the US began in Brussels. As a public reaction to criticism regarding the secrecy of negotiations, in January, the EU suspended talks over company investment protection for 3 months. EURACTIV Germany: Grünen-Leak: "TTIP bedroht Demokratie in Europa"
EURACTIV Turkey Ye?iller Partisi, gizli TTIP belgesini s?zd?rd? Les instances européennes sont en train de voler le pouvoir des citoyens européens. Ces machines a broyer la démocratie doivent changer ou disparaitre! I’m from Southern Europe, not a member of any green party, and I think the German Green Party has done us all a great service. Congratulations and thanks to them for ignoring “secrecy” taboos that only undermine what little democracy we have left. Large economic interests already have too great an influence on EU and national policy, and we can see the results in our societies. We should not go any further down the road towards an overpolluting, worker-unfriendly, wildly unequal society, that the USA has taken. In the May elections, if your MEP will not make a firm commitment to reject the TTIP in its entirety – then vote for somebody that will make that commitment. The TTIP needs to be destroyed – the EP elections are an opportunity to have a group of MEPs willing to do this. Well done the German Greens! The State makes the rules to protect citizens from the excesses corporations often go to in order to increase their profit margin. If the corporations are invited in to make the new set of rules, it does not take a lot of imagination to foresee the inevitable abuses. So how much did they pay to get their places at the negotiating table and hold the NGOs out? “Greens” are often thought of as, basically, anti business and this seems to prove it, I bet they would have no issues if similar proposals were placed into a TTIP with Venezuela. The Greens are not known as “Water Melons” by some for no reason, and not just on the right -green on the outside, red on the inside! It should be no surprise that since the fall of (eastern european) communism and thus the political far-left in western europe that some activists have attempted to hijack what in the 1970s were then honourable ecologist groups, for example Greenpeace. Speaking as a water melon and having looked into TTIP a little deeper than you appear to have done, David, I can only see your posting as an attempt to divert attention away from your own ignorance. TTIP is essentially an attempt to harmonise the regulatory framework between the USA and Europe. One of the main reasons I am sceptical is that the negotiations are being held in secret and our MEP’s are not on the negotiating team. We are being excluded. Yet the unelected European Commissioners, essentially the civil service of the EU are doing our negotiations. And as I understand it we will have no say on the matter because any final agreement reached will be imposed on member states. Further to that, Corporate America will have the right to sue any government in Europe including the UK for loss of profit if they believe a particular law which has been passed by a democratically elected government is the cause of their loss. In my humble opinion the whole thing is just an excuse for the USA to dump its chlorinated chickens, beef injected with hormones and antibiotics and genetically modified corn and other veg. It really does need to be scrapped. @Tony Ball: “corporations often go to in order to increase their profit margin”, oh please, you do realise that such profits are mostly used to create more employment, either directly via expansion of the said company or by venture capitalists using a share of that profit to invest in other existing companies or start-ups. Mr Smith, I know plenty of greens (do you?) they do not come across to me as anti-business. The discussion is going off topic – & the topic is the TTIP – the leak is helpful in throwing light on negotiations/outcomes that will have an impact on the ability of governments to make and enact laws. Your comments suggest that you favour the corporations and the undermining of democracy – come on – be a big boy and admit it. @Mike Parr: Funny then that this leak had to come via a Green party, if it’s so fundamental to TTIP why has no other political group leaked this? Oh and the Greens ARE anti business because they wish to place ever greater burdens and taxes upon business in the developed west but seem unconcerned (or worse, push for opt-outs) about the pollution from political regimes of the Left or so called ‘developing’ nations -put another way, CO2 has no respect of geopolitical boarders. Mr Smith – you have made a number of assertions – back them up. The topic is the TTIP and its anti-democratic nature. By any chance you are not a pro-TTIP troll are you? We don’t need populism but the TTIP ! !